Epson, the number-one selling projector brand worldwide, today announced the launch of the world’s first 3LCD ultra-short throw laser home theatre projector, the EH-LS100, bringing bright big-screen projection to homes. Epson’s first ultra-short throw laser projector for homes, the projector’s ultra-short throw design allows it to project at extremely close distances to a wall without need for mounting on ceiling, enabling easy installation and a seamless integration with the home décor. Projecting screen sizes ranging from 70 to 130 inches, the EH-LS100 offers WUXGA full HD resolution with brightness levels of 4,000 lumens of both white and colour brightness, delivering extraordinary image performance in a variety of lighting conditions. Users can experience deep blacks and brilliant colours at a high contrast ratio of up to 2,500,000:1 for an immersive and vivid home theatre experience. 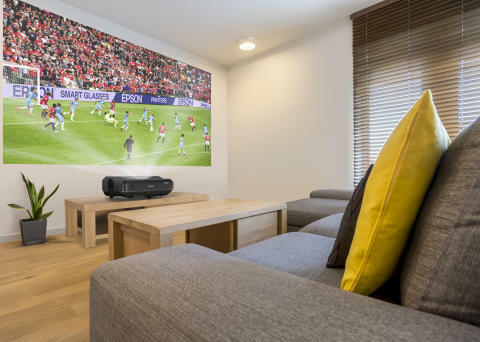 With its ultra-short throw capability, EH-LS100 is able to achieve a 100-inch projection with a placement of just 26cm away from the wall, overcoming the issues of distance and space in home projection systems. The EH-LS100 can now be placed in the same place and angle as conventional entertainment devices – users can simply plug in and play to enjoy a cinematic experience in the comfort of own home. With its innovative laser light source technology, the EH-LS100 has outstanding durability, delivering up to 20,000 hours of viewing, without need for maintenance and lamp replacement – this translates to more than 12 years of usage. With its laser technology, the projector brings instant on/ off performance – there is no need to wait for warm up or cool down, ensuring immediate projections. The EH-LS100 projector comes with a variety of connectivity options – including direct in-built Wi-Fi. Users can enjoy smooth wireless projection directly from Android and Apple iOS tablets, as well as smartphones through the iProjection app. It also comes with 3 HDMI ports that enable up to 3 different devices to be connected to the projector. With this, multiple devices can be easily managed with the use of a single remote control. Lastly, users can enjoy built-in 16-watt speakers without having to connect to an amplifier or separate speakers. “The EH-LS100 laser projector is Epson’s first ultra-short throw laser home projector and aims to bring affordable life-size images of up to 130 inches in beyond full HD resolution to the modern home theatre. In contrast to traditional home projection systems, users can incorporate the projector easily in the home interior without changing their current set up, and without concern for shadows, space or re-wirings. The EH-LS100 is the next step in projection technology in bringing everyday entertainment to the home for families,” said Ms. Tan May Lin, General Manager of Sales, Marketing and Customer Service division of Epson Singapore. Usage of more than 12 years if users averagely use about 4hours viewing a day.